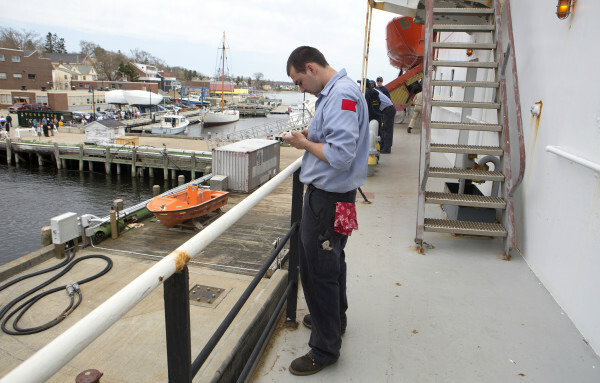 A Maine Maritime Academy student makes a final phone call while aboard the State of Maine as they get ready to depart Castine on their annual training cruise for students Tuesday. Ports of call scheduled for the three-month voyage include Cadiz, Spain; Cobh, Ireland; Charleston, S.C.; Norfolk, Va.; and Maine stops in Portland and Searsport. 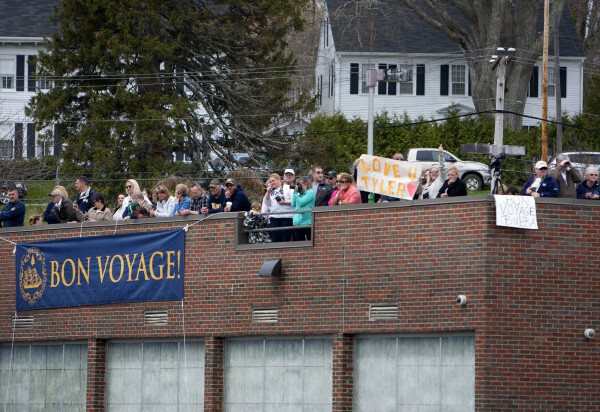 Friends and family gather to sendoff Maine Maritime Academy student aboard the State of Maine as they get ready to depart Castine on their annual training cruise for students Tuesday. 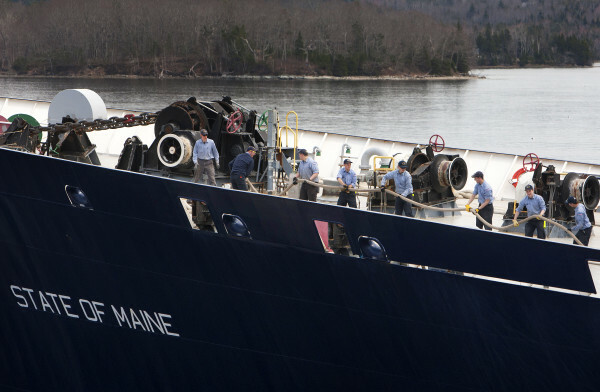 Maine Maritime Academy students aboard the State of Maine get ready to depart Castine on their annual training cruise for students Tuesday. 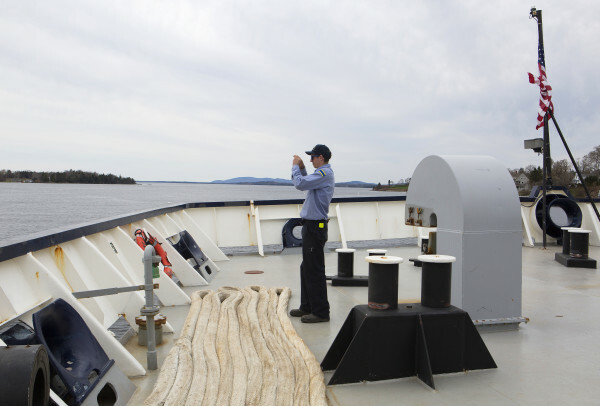 A Maine Maritime Academy student takes a photo while aboard the State of Maine as he gets ready to depart Castine on their annual training cruise for students Tuesday. Maine Maritime Academy students aboard the State of Maine get ready to depart Castine on their annual training cruise for students Tuesday. Ports of call scheduled for the three-month voyage include Cadiz, Spain; Cobh, Ireland; Charleston, South Carolina; Norfolk, Virginia; and Maine stops in Portland and Searsport. 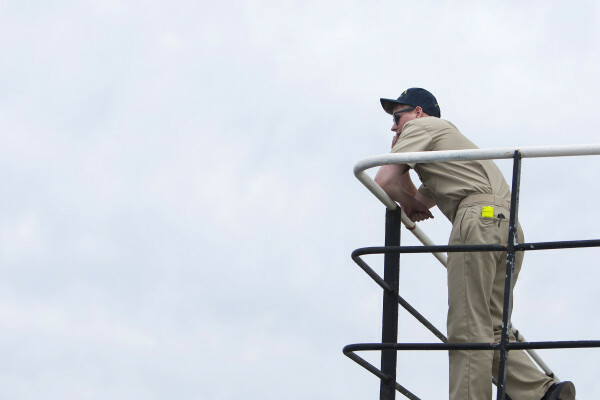 Maine Maritime Academy junior Brian Bentley sends a text while aboard the State of Maine before it departs Castine on their annual training cruise for students Tuesday. Ports of call scheduled for the three-month voyage include Cadiz, Spain; Cobh, Ireland; Charleston, South Carolina; Norfolk, Virginia; and Maine stops in Portland and Searsport. 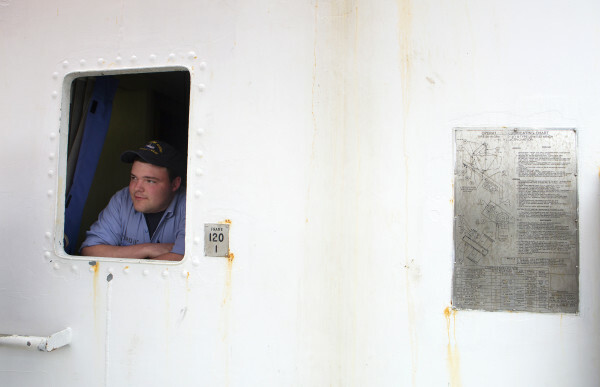 Maine Maritime Academy junior Tyler Tardif gazes out his peephole while aboard the State of Maine while waiting to depart Castine on their annual training cruise for students Tuesday. Ports of call scheduled for the three-month voyage include Cadiz, Spain; Cobh, Ireland; Charleston, South Carolina; Norfolk, Virginia; and Maine stops in Portland and Searsport. 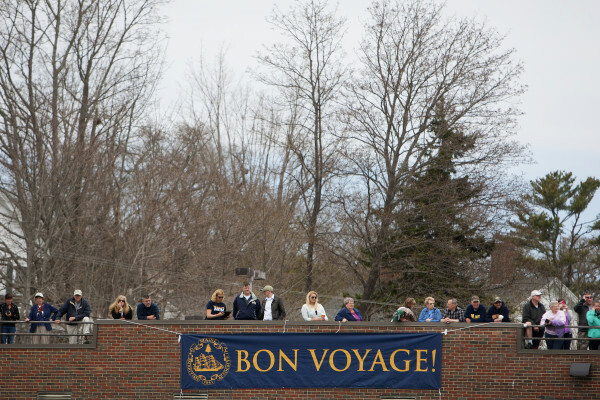 Friends and family gather to sendoff Maine Maritime Academy student aboard the State of Maine as they get ready to depart Castine on their annual training cruise for students Tuesday. Ports of call scheduled for the three-month voyage include Cadiz, Spain; Cobh, Ireland; Charleston, South Carolina; Norfolk, Virginia; and Maine stops in Portland and Searsport. 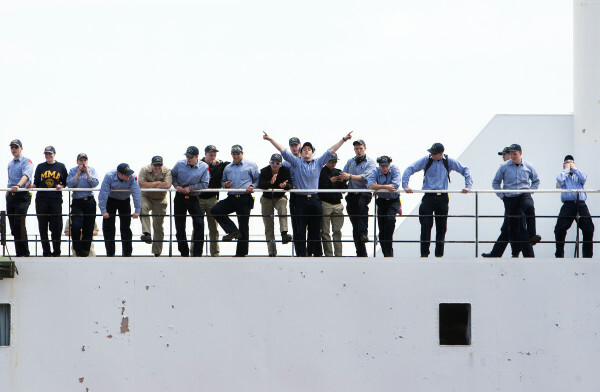 Maine Maritime Academy cross-county coach Ryan King makes an "x" with his arm to signal the cross-country student aboard the State of Maine as they get ready to depart Castine on their annual training cruise for students Tuesday. Ports of call scheduled for the three-month voyage include Cadiz, Spain; Cobh, Ireland; Charleston, South Carolina; Norfolk, Virginia; and Maine stops in Portland and Searsport. 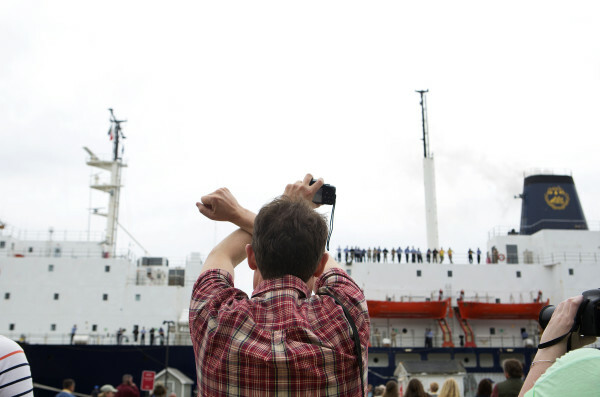 Maine Maritime Academy cross county coach Ryan King (left) and Riana Sidelinger takes photos of students aboard the State of Maine as they get ready to depart Castine on their annual training cruise for students Tuesday. Ports of call scheduled for the three-month voyage include Cadiz, Spain; Cobh, Ireland; Charleston, South Carolina; Norfolk, Virginia; and Maine stops in Portland and Searsport. 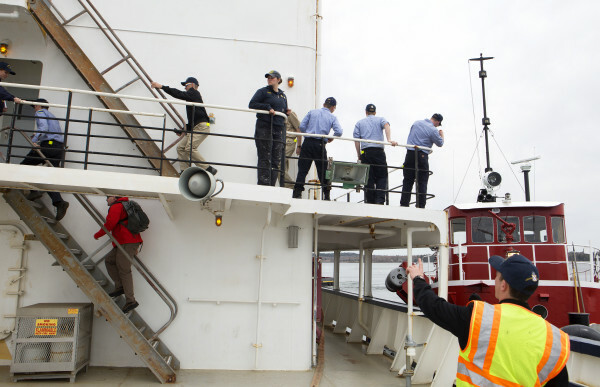 Maine Maritime Academy students aboard the State of Maine bring up the dock lines as they get ready to depart Castine on their annual training cruise for students Tuesday. Ports of call scheduled for the three-month voyage include Cadiz, Spain; Cobh, Ireland; Charleston, South Carolina; Norfolk, Virginia; and Maine stops in Portland and Searsport. 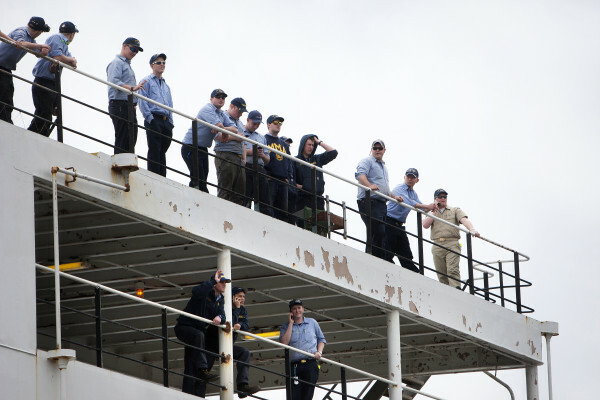 Maine Maritime Academy students aboard the State of Maine wave to family and friends as they depart Castine on their annual training cruise for students Tuesday. Ports of call scheduled for the three-month voyage include Cadiz, Spain; Cobh, Ireland; Charleston, South Carolina; Norfolk, Virginia; and Maine stops in Portland and Searsport. 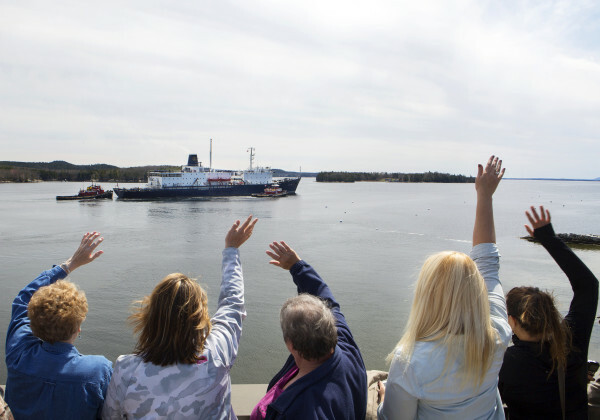 Friends and family sendoff Maine Maritime Academy students aboard the State of Maine as they depart Castine on their annual training cruise for students Tuesday. Ports of call scheduled for the three-month voyage include Cadiz, Spain; Cobh, Ireland; Charleston, South Carolina; Norfolk, Virginia; and Maine stops in Portland and Searsport. 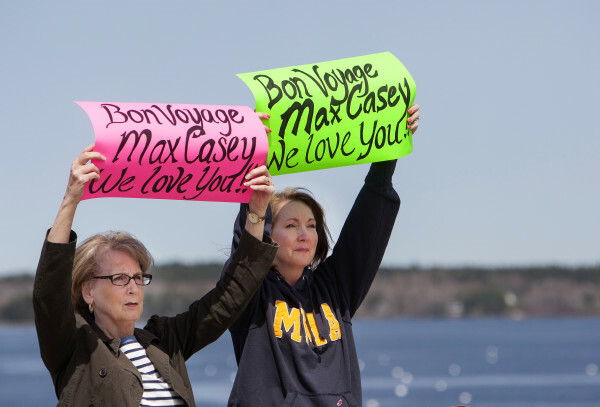 Linda Casey (left) and Erin Clark hold signs for Maine Maritime Academy student Max Casey who's aboard the State of Maine as they get ready to depart Castine on their annual training cruise for students Tuesday. Ports of call scheduled for the three-month voyage include Cadiz, Spain; Cobh, Ireland; Charleston, South Carolina; Norfolk, Virginia; and Maine stops in Portland and Searsport. 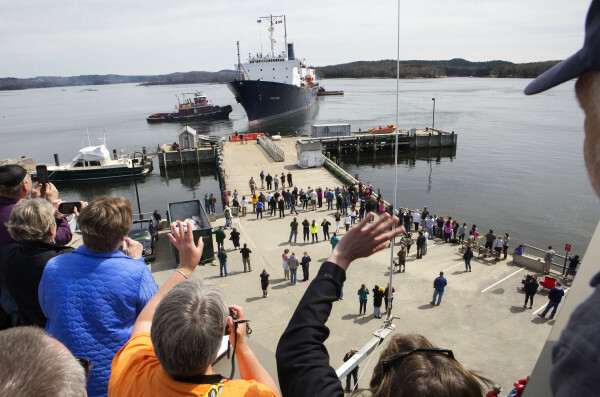 CASTINE, Maine — The State of Maine, a ship used by Maine Maritime Academy to prepare its students for lives at sea, motored Tuesday afternoon out of Penobscot Bay for its first-ever 90-day training cruise. 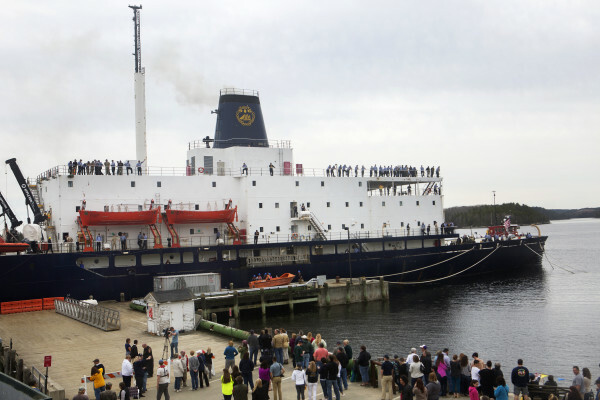 The 500-foot vessel will make four cross-Atlantic trips during the voyage, which is scheduled to last through late July, according to Nate Gandy, commandant of midshipmen at MMA. The ship will head first to Charleston, South Carolina, than to Cadiz, Spain, before returning to Portland. It then will head back out to sea, sailing to Cobh, Ireland, and then Norfolk, Virginia, before making its return to Castine. Prior MMA training cruises have lasted for 60 days, but the 2015 version has been lengthened because of new U.S. Coast Guard requirements for sea time and instruction. This year will be the first time that the State of Maine makes four trans-Atlantic crossings in a single cruise. 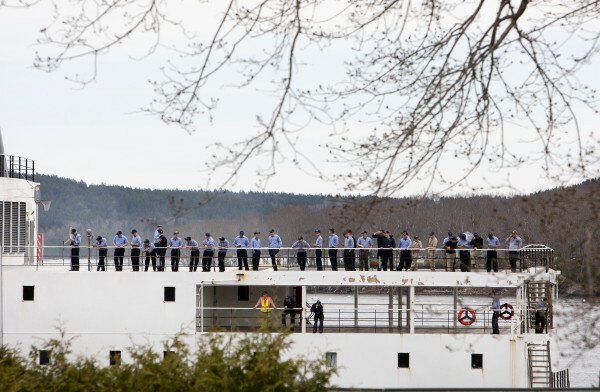 Approximately 250 students are on board for the cruise, along with 45 faculty, staff, officers and food service personnel, according to MMA officials. 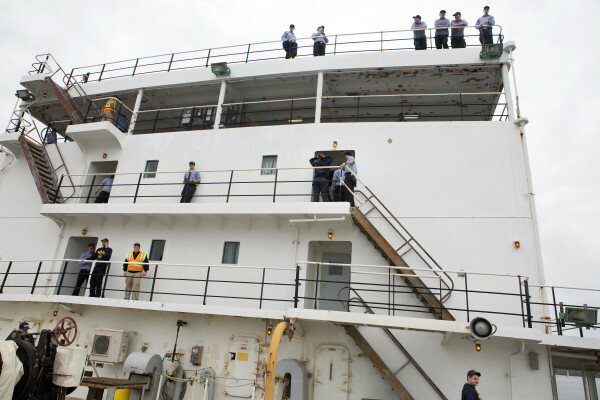 Students pursuing an officer’s license as a third mate or third assistant engineer now are required to train at sea for at least 300 days during their first three years at the academy, MMA officials have said. Each summer, freshmen and juniors sail aboard the State of Maine while sophomores are assigned to merchant ships across the globe. Gandy said Tuesday that the junior class is being split into two halves, each of which will spend 45 days on the boat. The first group of juniors will travel to South Carolina and Spain and then, after coming back, will disembark in Portland, where the second junior group will board and then travel to Cobh, Ireland, and Norfolk. Freshman on the cruise will spend the full 90 days on the cruise, he said. Students will get some time during the cruise to explore their ports of call, but most of the time they will be learning how to operate a large ship. Gandy said that few if any of the freshman want to admit to being nervous at going to sea for 90 days, even though some have never been out of sight of land. He said that, by the time the vessel returns to Portland, students will have adjusted noticeably to ocean travel. 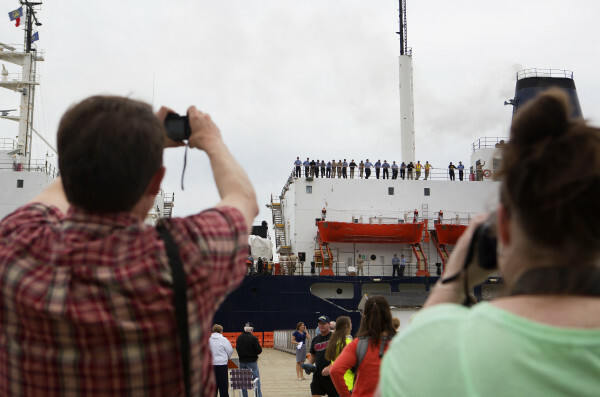 Speaking on board the former Navy research vessel about 90 minutes before departure, a group of freshman said they were ready for the voyage. J.T. DiGuglielmo of Milton, Delaware, said he has a stockpile of the motion sickness medication Dramamine in his gear, in case he gets seasick. “I probably got enough to kill a horse or two,” he said. DiGuglielmo said that, aside from being on the water, he expects the voyage to be fairly similar to his daily routine at the Castine campus. Patrick Larsen, a freshman from Dixfield studying to be an engineer, said he hopes to have the engine room “practically memorized and fully learned” by the time the cruise ends. “I want to live down there, almost,” Larsen said. 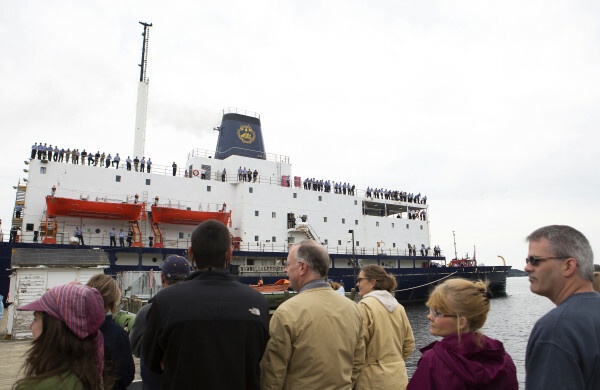 Gandy said that students will receive some survival training during the cruise at an Irish maritime facility near Cobh. Students will get soaking wet in flooding simulations and in life raft training in a “huge” pool with artificially generated waves. The freshmen echoed Gandy’s enthusiasm for the planned survival training in Ireland. Shelley and Chad Whittemore stood on the MMA pier Tuesday afternoon as the ship headed south toward the mouth of Penobscot Bay. They said their son Chase, 19, was eager to get out on the open ocean. The freshman’s mom said that Chase frequently came home to Skowhegan on weekends, so they will have to get used to not seeing him for several weeks at a time. They plan on meeting up with their son in Portland during the mid-point of the cruise in mid-June, she added. The separation will be more acute for their family than for her son, she said. Prior MMA training cruises have taken students to Aruba, Belgium, Bermuda, Brazil, Canada, Estonia, France, Germany, Iceland, Italy, Malta, Poland, Puerto Rico and Russia, among other countries. The MMA ship stopped in Cobh, Ireland, during its 2011 training cruise. The vessel has limited Internet connectivity while on cruise. The Bangor Daily News will continue to donate daily news service, sending state-wide, national and world news, sports and business articles via email. 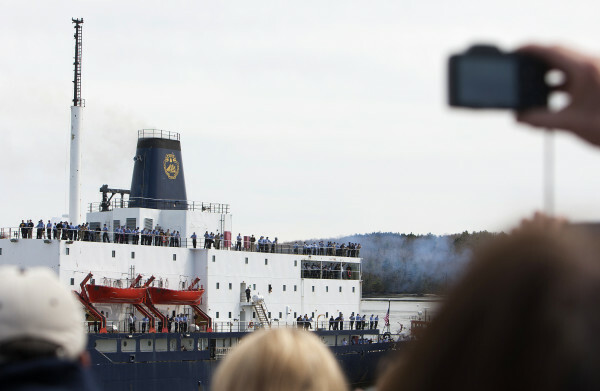 Video of the ship’s departure can be viewed on the MMA website at http://mainemaritime.edu/streaming/. Friends, family and fans are invited to follow the ship’s journey through the cruise blog at cruise.mainemaritime.edu and the cruise Facebook page: www.facebook.com/mainemaritimecruise.